Quite a change at this year’s London Motor Show compared to the last one, two years ago, where electric cars were relegated to the small stands at the cheap end of the hall. This year they were smack in the middle of the show, literally and metaphorically. The phallic Lightning electric supercar, unveiled to much fanfare on Tuesday, is breathtaking but pointlessly large, heavy and extravagant. And a bit iffy. Its claimed 10-minute recharge time demands a hefty industrial three-phase supply and would create problems we have already discussed at length. We do like its “+” and “-” accelerator and brake pedals, though, even if they aren’t original. 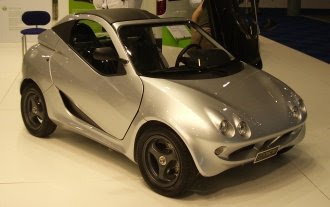 Pedals aside, we preferred the miniscule Super Light Electric Sport Car, a Nice Car Company/Cranfield University design study. Shame it’s not destined for production. The scissor doors incorporating targa roof panels add drama but subtract practicality: they get in the way as you struggle to fold your leg in through the tiny door opening. Inside it feels cosy or claustrophobic, depending on whether you like spending time locked inside a carbon fibre cupboard. According to the bored bloke in a Nice shirt lounging nearby, it won’t go into production because “it’d be too expensive, wouldn’t it”. That’s how to win friends and influence people. Nice was of course also showing off a two-seat electric whiz-kid you will be able to buy later this year, the made-in-Hong-Kong MyCar. 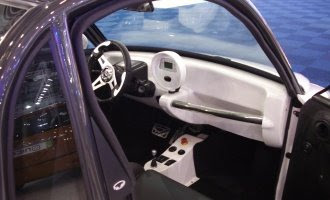 Taller and cuter than the Super Light, the MyCar (or MyQuadricycle to be brutally accurate) will cost £8,995 and will travel 55 miles and at 40mph after a 5-hour charge. The combination of a 710kg kerb weight, four lead-acid batteries and a DC motor suggest a sluggish rate of progress. We’ll have to wait till we can drive it to be sure. Still, it felt great inside, with good seats and a dashboard design that revels in its shiny plastic materials, rather than trying to ape the soft-feel rubberised mainstream and falling short, like the Nice Mega City. The interior of the Think City is okay, but we weren’t quite convinced that the exterior has the quality look and feel to justify its planned price. It looks like a product of Addis, purveyor of plastic kitchenware. The sticky-out amber lights in the wheel-arches look odd, and there’s something really strange going on in the bodywork where the front wing meets the lower leading edge of the door. When you see one, you’ll see what we mean. Our star of the show? Everyone raved about Honda’s OSM sportster, which is lovely, but we were quite taken by the production version of the Toyota iQ. In the metal this poor little posh car looks much more mature, solid, interesting and appealing than in pictures. It will seat four at a pinch, but will boast CO2 emissions of just 99g/km and cost less than £10,000 with lots of toys as standard when it goes on sale this year. We want one. With Honda intent on putting small hybrids into production, we wonder if Toyota will be tempted to offer an iQ with batteries and a motor? With all that’s changed in the last two years, stranger things could happen.